The first piece of news on Hamerton's website for 2019 is that the rufous bettongs are flourishing in their off-show accommodation with at least three joeys having been born and left their mother's pouches (there may be more young, as the second bettong group is still quite shy). Plans are being made to put some bettongs on-show during 2019. If the breeding success with the bettongs continues babies born at Hamerton will be sent to other zoos in Germany and the Czech Republic later in 2019. TeaLovingDave, Brum, ThylacineAlive and 3 others like this. A first visit of the year today and on a cold windy winter afternoon, I was surprised just how many species made an appearance. I was most surprised to see tiger quoll outside in both enclosures. The highlight was seeing a Sumatran white bearded civet in both enclosures late in the day. The one next to the Jaguarundi was much more confident and came right up to the front fence, but the one next to the grison shot off as soon as it saw me. Saw one jackal briefly and a caracal in the back part of the old tiger barn. Very brief views of rusty spotted cat and Oncilla. I actually got to see the ears of the brush tailed possum in its box, no sign of the Ringtail possum. The Wombats were indoors all afternoon, though one was awake and eating on my final return to the exhibit . Was surprised to see so many potoroo outside and very active in both enclosures, one group in the former yellow mongoose cage, the others in with the brush turkeys next to the Pudu. Saw a Cassowary in the back enclosure, not sure whether it is the original one or a Johnstone's. Good to see the yellow spotted hyrax on show,, in the reptile House. Ashleigh.N, Brum, WhistlingKite24 and 5 others like this. 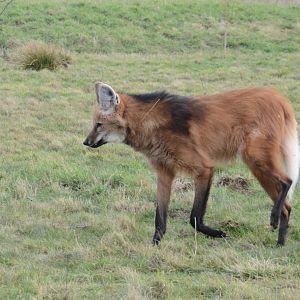 A new male maned wolf has arrived at Hamerton earlier this week from Leipzig Zoo and has been introduced to the female that arrived last year in the main paddock. Other developments mentioned in this news article include two new cheetah enclosures and a new cheetah house which have just been completed, alterations to the car park and entrance are now underway and three enclosures for new species received last autumn (but still off-show) are nearing completion. ThomasNotTom, hmb_zoo, sooty mangabey and 3 others like this. I've not visited this last week (usually manage to go most weeks) so will make a beeline for their paddock this week. Great news, their keeper was telling me a few weeks ago that they were hoping to get Bali a mate soon as her previous mate died last year. three enclosures for new species received last autumn (but still off-show) are nearing completion. Do we assume these to be the rufous bettongs or are there more gems yet to be unveiled? Assume nothing its Hamerton,if only people knew what was going on at the place!!! KevinVar, Kifaru Bwana and pipaluk like this. You've ramped up my expectations now. If he doesn't pull a Javan rhino out of the bag I'll feel nothing but disappointment. Arizona Docent, SHAVINGTONZOO and FunkyGibbon like this. I thought Hamerton bred their Cheetahs already ? Most they bred had been imported to Australia which is how they've got the link up to get many of the Australian animals. I would say there is no chance Hamerton will join Eaza or Biaza. Indeed, Hamerton consider it's 'Cheetah Country' to be "the most important facility for this endangered cat in the UK and will be developed further, as and when necessary." How is the big development in the centre of the park coming along? I haven't been for a few months now and hoped someone might have added a photo or two of the container block. Having spoken to a keeper recently - he said that they were putting a halt to breeding for a short while. I think they stopped breeding for a few years, but now they have the new bloodlines they’re starting up again? I went yesterday and there is lots going on with construction in the area behind the Anteater section plus work too on areas on the exit to the Outback Aviary. They were working on a new cafe to the left of the entrance when I arrived, apparently the local council wouldn't allow them the planning they originally had hoped for so have had to compromise but at least they are now able to improve things. All in all there was lots of activity around the whole site. I had hoped to see the new Maned Wolf - Carlos - but neither two were out and about, their keeper told me they are 'tolerating' each other for now but it's really early days - it's been very stressful for Carlos not only to travel from Germany but then find you have a new 'friend' to get along with. Here's hoping for a good outcome later in the year when their breeding season starts. BeakerUK and littleRedPanda like this. Behind the Anteater, to the side of the Outback Aviary will be the new Meerkat exhibit, as well as the Nocturnal house. This has been ongoing for quite a while. Was the keeper talking about cheetahs or keepers? SHAVINGTONZOO, Arizona Docent and Mo Hassan like this. Why is Hamerton developing a new meerkat exhibit? I prefer Ned's idea of a Javan rhino exhibit. SHAVINGTONZOO and Ned like this. "2.3 Southern Cheetah arrived at Hamerton from South Africa during April. In the same week, 3.1 Cheetah (all bred at Hamerton) were shipped out to zoos in Australia"
As reported above in the 2017 thread, the park imported five cheetahs from South Africa (specifically from Ann van Dyk Cheetah Centre). What was not mentioned (which I just read in Zoo Grapevine Summer 2017) is that four of the five cats are carriers of the king gene, which leaves open the possibility of king cheetahs being born (which leaves open the inevitability of a visit from a certain American moderator). This might have been him today, judging by the lack of black up the neck compared to your photo of Bali ... could be wrong though. Cafe which will also have fish tank exhibits will be open for Easter. Nocturnal house is coming along well and they are in process of renovating the Bats exhibit to link with Nocturnal House. They are starting the outside decor to Nocturnal house and it’s hoped it will be completed this year. Work on the second Possum exhibit is nearly complete and viewing window for Black Pademelon and Southern Casowary (currently offshow) nearly complete. Should be finished for Easter. Parma Wallaby’s and Swamp Wallaby’s have Joeys. Baby Camel has been born. On a sadder note the male Eastern Aardwolf has passed away leaving just one female Eastern Aardwolf on show.